Delhi Winter time is Party Time! Nowadays many Keralites are either giving up having rice completely or reduce the consumption of rice. There may be various reasons for the abstinence. They might have been asked to stay away from rice because of diabetes. Or they might want to reduce weight. In some cases, the abstinence from rice helps to reduce inflammation. For a Keralite, there is nothing as torturing as staying away from rice and rice flour food. So they have their cheat day. Some say that it is better to die than to live without having rice. A doctor opined that ‘wheat is heat and rice is ice’. Since people suffering from arthritis must have warm they must have wheat and avoid rice says the doctor. Here are a few Kerala breakfast recipes with wheat flour or atta. Recipes like idiyappam, kozhukattai, vellayappam, vattayappam and puttu which are traditionally prepared with rice flour, are here prepared using wheat flour or atta. To some extent, the craving for the rice-based Kerala recipes can be subsided by having the wheat-based alternatives. All the traditional combinations go well with the recipes. For instance, chickpea curry and atta puttu taste as good as the chickpea curry and rice flour puttu. While trying out the atta variation of the Kerala recipes I stumbled upon a new wheat flour recipe – Yeast made of wheat flour. The recipe for the homemade wheat flour recipe is included as a bonus in this post. How to squeeze out, effortlessly, the idiyappam dough through the idiyappam maker is the main issue. Preparing idiyappam with rice flour itself requires a good amount of effort. Watch the video to find out how to prepare atta or wheat flour idiyappam easily. I searched the internet thoroughly but could not find the exact substitute for the Kerala Kozhukattai using wheat flour or atta. Here is the wheat flour Kozhukattai which I am experimenting for the first time. The texture was good and the inside portion also cooked well. My family said the kozhukattai tasted good too. You can watch the recipe and improve on it. Send your version of wheat flour kozhukattai and we can publish it. Vattayappam is mainly made on Maundy Thursday, the day before Good Friday to remember the last supper that Jesus had with his disciples. Traditionally vattayappam is prepared without yeast. Since the unleavened vattayappam is a bit hard nowadays people add a little yeast. Here is atta or wheat flour vattayappam in particular for those who cannot have food prepared with rice flour. Vellayappam with curry is the main food to celebrate Easter and Christmas. And what if you are not allowed to have rice-based food. No issues!! Prepare vellayappam with wheat flour. The appam came out very well and tasted yummy with the festival special curries. Watch the video to know more. Atta or Wheat flour puttu recipe is as old as the arrival of wheat flour to Kerala. It is an easy and commonly prepared breakfast. However I am sharing the wheat flour puttu for those who are yet to learn the art of preparing atta or wheat puttu. This happened accidentally. I wanted yeast for a recipe and there was no option for shopping at that moment. That is when I came across various options to prepare homemade yeast. Here is one method using wheat flour. This yeast is good and effective. Probably takes a bit longer than the dry yeast for fermentation. Check out the recipe here. During the Christmas season, there is one more day, other than 25th December, which is very anxiously awaited. That is the day of baking cakes. Since the baking has to be done on a large scale we get the cakes baked in a bakery. There will be a long queue waiting for their turn to bake their cakes. So we have to book the date and token number in advance. This year our token number was 3, on last Saturday. When we wait our turn inside the bakery we can learn a lot of tips on how others mix ingredients for their cake. First, the workers mix the eggs, butter and sugar with a huge whipper. Then the mix is poured into a large wok. And the flour is mixed. Now it is the turn of the customer to add his or her ingredients that give the customized, specialized or homemade flavour, taste and texture to the cakes. Some add orange juice. Others add sugar syrup. Others add lemon rinds and so on. When you see the ingredients, you feel like “oh my God! why didn’t I think of these ingredients. This would have given a special taste to my cakes. No problem, I will add next time”. When we reached, the bakery, this time, the mixing process of token no. 1 was going on. The customer was coolly monitoring the mixing of the ingredients. When the Baker asked him to finally add his secret flavours the entire scenario changed. He politely ordered them to divide the batter into three parts. And each part was put a different wok. Now he added pineapple essence in one part. In another, he added cocoa flavour and cocoa chips. The way he administered the measurement of ingredients, I was sure he was not an amateur. Someone whispered that he is a Chef at Hotel Siddharth. When I talked to him, his name is Hansi Gomes, he said that the third flavour he prepared today was Meetha Paan Cake. I was on the lookout for a Christmas special article. I knew Meetha Paan Cake would be the best Christmas gift for the readers of lifestyletodaynews.com. I requested him to share the recipe for the website. He not only agreed to share the recipe but also gifted me one Meetha Paan Cake. The cake was yummy and refreshing. For those who were born and brought up in north India, meetha paan brings childhood memories. Meetha Paan, which was the served at the weddings in the past, has a nostalgic feeling. If you had enjoyed chewing meetha pan, in your childhood, at wedding functions, you are surely going to like this cake. Take the butter in a bowl and add sugar powder. Mix it well until the butter is foamy. Now add the eggs one by one. Whip well for a while. Let the mixture become soft. Now add vanilla essence, food colour and baking powder. Mix well. Add the flour little by little and make a lump-free batter. Add gulkand, peppermint and paan petta and mix well. Bake it is a tin mould with a butter paper placed at the bottom. The baking takes at least 45 minutes. In order to know if the cake is properly cooked poke a toothpick at the centre of the cake. If the toothpick comes out clean, then the cake has been perfectly baked. Hansi Gomes is a Chef at Jaypee Siddharth Hotel, New Delhi. He was kind enough to share his recipe for Meetha Paan Cake. A novel recipe for aspiring cooks and passionate bakers. Thank you Mr Gomes for sharing the recipe. Iron is an important mineral for our body, especially for pregnant women, and children. Here is a recipe with iron-rich food items which will help in an increased intake of iron in your daily diet. The dish is prepared tastily which even the children will love the recipe. I know because my Children like the beetroot Oats Kheer that I prepared today. Add the water to the Oats. Add Milk to the Oats. Mix all the ingredients and simmer for 15 minutes. Remove the cooked oats from the fire. Add the grated beetroot immediately. Mix well and remove to a serving bowl. Fry a few Cashews and Raisins in ghee or butter. Beetroot Oats Kheer is Ready!! Have the Kheer Hot or Cold. St Gregorios is a Kerala saint. His death anniversary, on November 2nd, is celebrated by devotees who are settled in different parts of the world. There are Churches with St. Gregorios as a patron saint in many places in India and abroad. During the festival, the devotees bring unniyappam as offering to the Church. And the unniyappam is distributed to all who come to the Church. Unniyappam is a fried rice snack with jaggery and sugar, prepared in a special mould. My mother’s generation were experts in preparing Kerala dishes. So they prepare hundreds of unniyappam as offering to the Church. I learned unniyappam by trial and error method. Searching for recipes on the internet and taking tips from mother and aunties. This year two weeks before the festival, I made a trial version of unniyappam, so as to get myself prepared for the main day when I have to fry more than a hundred unniyappams. My friend Manju visited me just a few minutes after I finished preparing the unniyappams. She liked it so much so that she asked me to share the recipe on youtube. I am sharing the trial version itself. Newly married girls who are preparing unniyappams on a large scale for the first time, will find the video useful. The video is shaky and not of high quality since this video was not initially taken for publishing. I hope the video gives some helps you prepare the large number of unniyappams. In cities like Delhi, where the devotees lack time, they have found some tricks to prepare large quantity unniyappams quickly. I will share the recipe here. Melt the jaggery in 1 glass of water. Mash the bananas in a blender. Mix the jaggery and mashed banana. Roast the coconut in 2 tablespoon ghee, until golden brown. Mix the coconut, sesame seeds and baking soda in the batter. Keep aside for 45 minutes. Keep the unniyappam mould on one gas stove burner. On another keep a frying pan with 2 glass oil. When the mould is hot add 1/2 teaspoon ghee in each mould. Now fill the moulds with oil. Let it get very hot. Now pour the batter. If the batter is thick, add warm water or melted jaggery. When the unniyappam turns brown at the bottoms turn them using a fork or a thin skewer. When both sides are a bit brown, transfer them to the frying pan. Fry until the unniyappam is Crisp and brown. Remove on a plate spread with tissue paper. With 2 glass of rice flour, I prepared 50 unniyappams. Yesterday, was Easter and the 40 days of fasting and 10 days of the passion week has come to end. This year many people said that they never knew that christian fasted and abstained from non-vegetarian food, including milk and alcohol, for 50 days in a year. Fasting, abstaining from certain food, penance and praying has relevance in the Christian religion, from the time of Christ itself. Christ went on a 40 days fast in the wilderness, before beginning his 3 years ministry leading to his Crucifixion and Resurrection. 40 days lent is one of the basic foundation the Orthodox and the Catholic churches, founded by the Apostles. Believers get purified, detoxified and they get the energy to survive spiritually for the next one year. Christianity came to Kerala in the early days itself, when St. Thomas (who is know as Apostle of India), came to India in AD 52. In the past 2000 years, Kerala Christian’s tradition of prayer, food, and culture is a blend of the Bible, the life of Jesus, the association with other Apostolic Churches in the world and Kerala tradition. The first forty days of fasting is purely full of prayers, fasting even without drinking water upto 12:00 pm; and having lunch after the Mid day prayer and kneeling 40 times. The simplest form of fasting is abstaining from meat, fish and egg for 50 day. The toughest form of fasting depends on the one who fasts. Some of the Ashram priests, it is said, have light lunch including kanji (water rice or gruel) and stir fried moong (green gram). And they have even lighter supper — Such men do not live by bread alone but by the word of God. There are a lot of symbolism connected with the lent season, which raises nostalgia. Certain lent food prepared during the last 10 days of the passion week have lot of symbolic value. The 40 days of fasting ends on the Friday before Good Friday, and the next 10 days are dedicated for more prayers and more spiritual activities. The family of Lazarus, and his two sisters, Martha and Mary, was Jesus’s favourite. Lazarus died and was buried. On the third day Jesus came and rose Lazarus from the dead. It is said that Kozukattai was one of the favourite food of Jesus. He had kozukattai with Lazarus family. The raising of Lazarus from the dead is remembered on this Saturday. 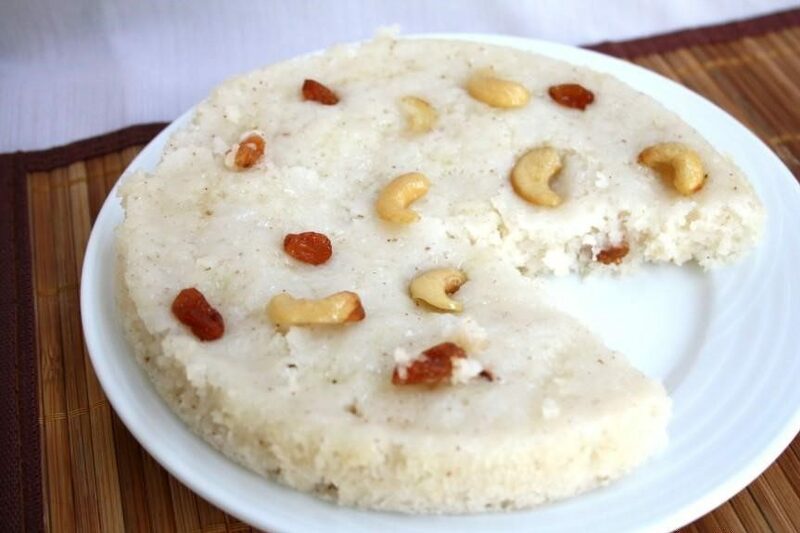 People make kozukattai at home and share it with friends, relatives and neighbours. Kozuattai are steamed rice dumplings with a stuffing of cocounut gratings, jaggery and a pinch of cardamom. The tradition of Pesaha Appam dates back in the Jewish tradition 2000 years before the birth of Jesus. The Jews remember the Passover day when the Israelite’s left the Egyptian slavery and started their Exodus to Israel. During the preparation to leave Egypt, the Israelite’s were asked by Moses to prepare unleavened bread. On the day before his Crucifixion on Good Friday, Jesus observed the Jewish Passover festival with his 12 disciples, at the house of Mark. The ‘Last Supper’ painting of Michelangelo depicting the event is very popular. Kerala Christian prepare unleavened bread or Pesaha appam (Pesaha mean Maundy Thursday) with rice flour and urad dal as the main ingredients. There are a number of different variation of preparing pesaha appam. And an accompaniment called Pesaha pal is also prepared. In traditional homes all the members of the family gather round the table, with the head of the family at the main chair. The youngest member of the family will ask the head of the family about the relevance of the festival. He will explain and distribute the appam to the family members. Rice Gruel (kanji) at the end of the long Good Friday service is a nostalgia for Kerala Christians. After fasting for the whole day, and having Chorukka (bitter drink) at the end of the service, the Rice Gruel, with stir fried green moong (green gram) and kadu manga(a special mango pickle) is an incomparable delicacy blended with spiritual and traditional values. In olden day the Kanji was served in earthen place with jack fruit leaves shaped as spoons. Vellayappam is kind of dosa prepared from rice flour, crated coconut and; fresh coconut toddy or yeast used as leavening agent. On the two main festivals of Kerala Christians, Christmas and Easter, vellayappam is prepared in large numbers for the relatives, neighbours and helpers. For a Kerala Christian Christmas cake is exotic. For them vellayappam with chicken or mutton stew symbolises the celebrations of Christmas and Easter. Copyright © lifestyletodaynews.com. All rights reserved.